On Saturday 2 February, 43 refugees from Afghanistan, Sudan, Iraq and Iran boarded a bus in Dandenong to travel to the Brighton Beach Life Saving Club for a day of learning and fun. The Water Safety Day is the brainchild of Lesley Fleming, a member of the Brighton Life Saving Club who has been supporting CatholicCare’s work with refugees for the past seven years - first as a magistrate at Dandenong Magistrates’ Court, where Lesley and her friend and colleague, Magistrate Pauline Spencer, were partnering with CatholicCare to deliver the Justice Education Program to refugees. 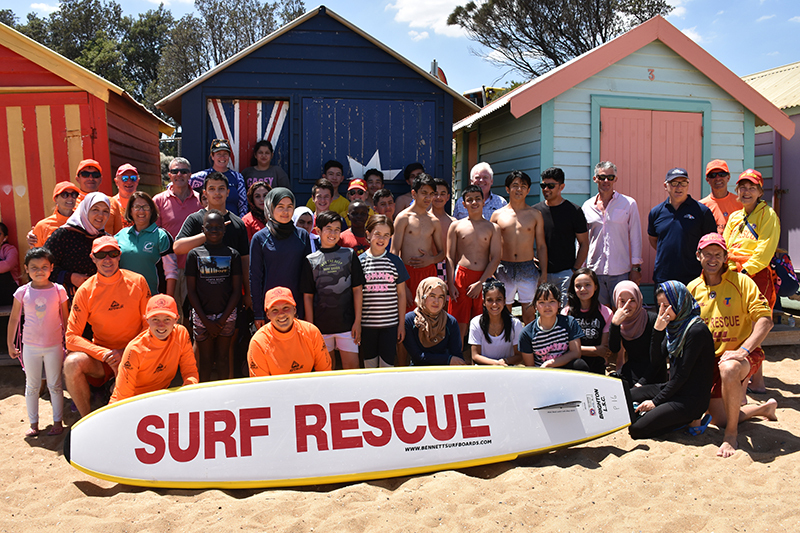 Photo: Refugees, Life Saving Club members and special guests in front of the Brighton Bathing Boxes. Lesley pulled together the water safety program to continue her support of newly-arrived refugees, and it is now in its fifth year. While Pauline is still involved in delivering the Justice Education Program in collaboration with CatholicCare and the Dandenong Magistrates’ Court, she also attends the Water Safety Day to offer her support. 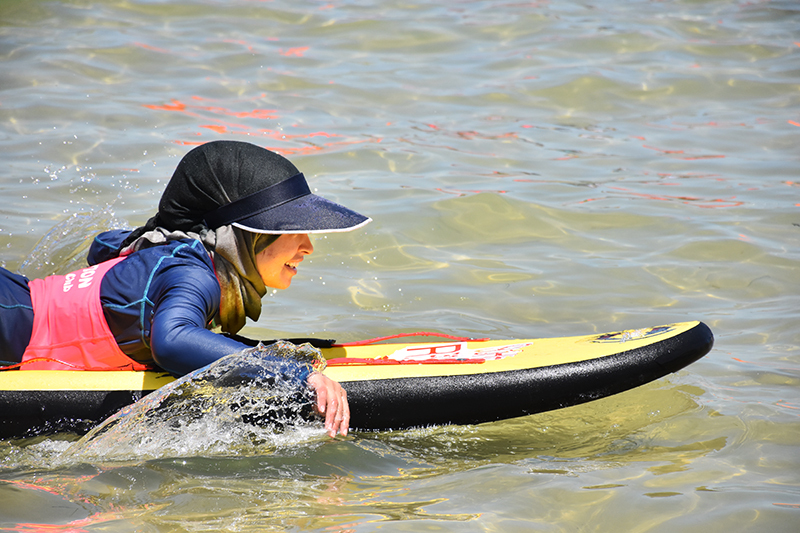 Photo: Refugee participant paddling at Brighton beach. Pauline was joined by other special guests, including Tim Wilson, MP Member for Goldstein, Victoria; Michael Heffernan, Mayor of the City of Bayside; John Olle, Victorian Coroner; Hon Mark Dreyfus QC, MP Member for Isaacs, Victoria; James Newbury, MP for the electorate of Brighton; David Holland, Manager of Multicultural Projects at Life Saving Victoria; Father Martin Dixon, Parish Priest at St. Joan of Arc; and John Sheldon, Chair of the Board at CatholicCare. 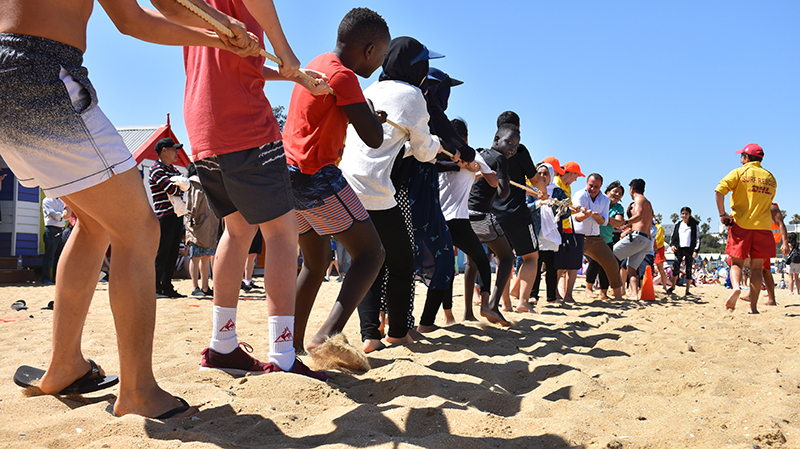 The day began with an information session on Australian beaches - particularly the associated dangers and safe swimming practices - and then shifted into a fun and engaging time with participants enjoying tug-of-war, beach soccer, volleyball and paddling in the sea. Photo: Tug-of-war at Brighton Beach Water Safety Day for newly-arrived refugees. Many of the refugees who attended the event had limited or no experience with swimming or with beaches; they were eager and enthusiastic to get involved and to learn about a new environment. It was particularly inspiring to see some of the participants in the water who had arrived on the day saying they wouldn’t be swimming. ‘One of the women, at the beginning of the day she wasn’t prepared to get in the water. But then she went in the water and started walking - now she’s swimming. You can see how’s she’s transformed from the start to the end of the day,’ says Tomasa Ruiz, Manager of the Refugee Settlement Program at CatholicCare. Troy Ross, President of Brighton Life Saving Club, also attended the event and was engaged in the activities. ‘We’re so happy that [Lesley] started this program - we would like to see it rolled out to every Life Saving Club in Australia,’ said Troy. Photo: CatholicCare staff and special guests at Brighton Beach Water Safety Day for refugees. 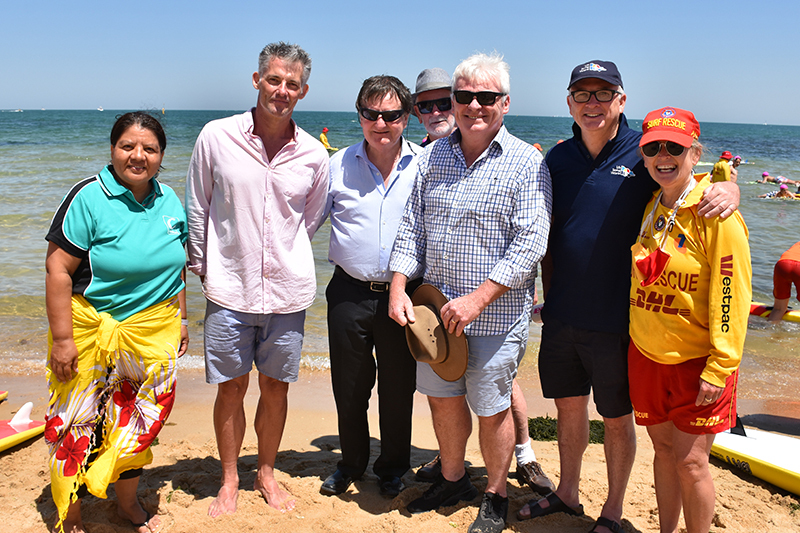 Life Saving Victoria runs dozens of water safety programs with Culturally and Linguistically Diverse (CALD) communities across the State, and in the past year have run near to 130 different training programs. Days such as these are imperative for the safety and the overall wellbeing of refugee and CALD communities who are settling in Australia. The isolation, and often trauma, experienced by refugees can make their settlement journey difficult, and so offering fun community events such as these is helping to break the barriers to social inclusion. CatholicCare would like to say thank you to the Brighton Life Saving Club for organising and hosting the Water Safety Day for refugees. This would not have been possible without their support and generosity throughout the past five years. We hope to continue and grow this event for years to come, helping more and more refugees to settle well in our community. Find out more about our Refugee Settlement Program.